The launch of Space Shuttle Discovery on its first mission on 30 August 1984. STS-41-D was the 12th flight of NASA's Space Shuttle program, and the first mission of Space Shuttle Discovery. It was launched from Kennedy Space Center, Florida, on 30 August 1984, and landed at Edwards Air Force Base, California, on 5 September. Three commercial communications satellites were deployed into orbit during the six-day mission, and a number of scientific experiments were conducted. The launch was originally planned for 25 June 1984, but because of a variety of technical problems, including rollback to the Vehicle Assembly Building to replace a faulty main engine, the launch was delayed by over two months. The 26 June launch attempt marked the first time since Gemini 6A that a manned spacecraft had experienced a shutdown of its engines just prior to launch. While evacuating the shuttle, the crew was doused with water from the pad deluge system, which was activated due to a hydrogen fire on the launch pad caused by propellant that had leaked out of the engine nozzles and spilled into the flame bucket following shutdown. Because the fire was invisible to humans, had the astronauts used the normal emergency escape procedure across the service arm to the slidewire escape baskets, they would have run into the fire. 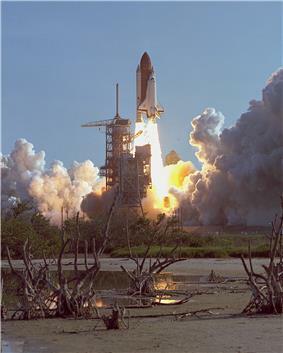 STS-41-D finally launched on 8:41 am EDT on 30 August after a six-minute, 50-second delay when a private aircraft flew into the restricted airspace near the launch pad. It was the fourth launch attempt for Discovery. Because of the two-month delay, the STS-41-F mission was cancelled (STS-41-E had already been cancelled), and its primary payloads were included on the STS-41-D flight. The combined cargo weighed over 41,184 pounds (18,681 kg), a record for a Space Shuttle payload up to that time. 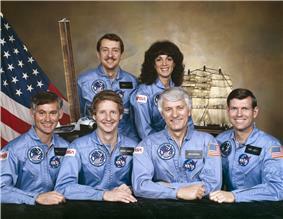 The six-person flight crew consisted of Henry W. Hartsfield, Jr., commander, making his second shuttle mission; pilot Michael L. Coats; three mission specialists – Judith A. Resnik, Richard M. Mullane and Steven A. Hawley; and a payload specialist, Charles D. Walker, an employee of McDonnell Douglas. Walker was the first commercially-sponsored payload specialist to fly aboard the Space Shuttle. Another payload was the OAST-1 solar array, a device 13 feet (4.0 m) wide and 102 feet (31 m) high, which folded into a package 7 inches (180 mm) deep. 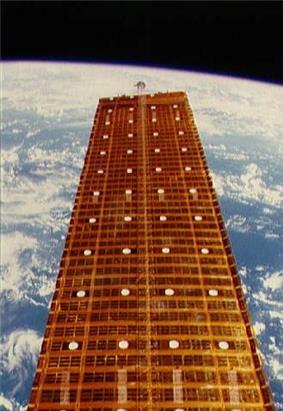 The array carried a number of different types of experimental solar cells and was extended to its full height several times during the mission. At the time, it was the largest structure ever extended from a manned spacecraft, and it demonstrated the feasibility of large lightweight solar arrays for use on future orbital installations, such as the International Space Station. The McDonnell Douglas-sponsored Continuous Flow Electrophoresis System (CFES) experiment, using living cells, was more elaborate than the one flown on previous missions, and payload specialist Walker operated it for more than 100 hours during the flight. A student experiment to study crystal growth in microgravity was also carried out. 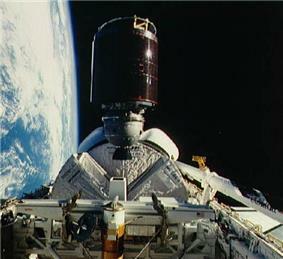 The highlights of the mission were filmed using an IMAX motion picture camera, and later appeared in the 1985 documentary film The Dream is Alive. 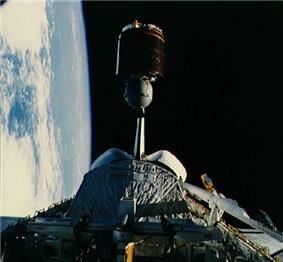 Because of an obstruction in the shuttle's external wastewater dumping system, a two-foot "pee-sicle" formed during the mission; Hartsfield removed it with the Remote Manipulator System. The mission lasted six days, 56 minutes, and 4 seconds, with landing taking place on Runway 17 at Edwards Air Force Base at 6:37 am PDT on 5 September 1984. During STS-41-D, Discovery traveled a total of 2,490,000 miles (4,010,000 km) and made 97 orbits. The orbiter was transported back to KSC on 10 September. Ominously, STS-41-D was the first Shuttle mission in which blow-by damage to the SRB O-rings was discovered. The 12 stars within the blue field indicate the flight's original numerical designation as STS-12 in the Space Transportation System's mission sequence. 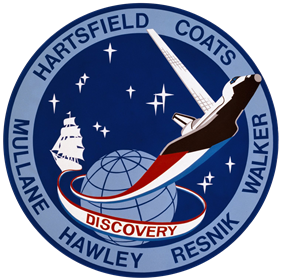 A representation of Discovery's namesake is manifested in a sailing ship, which is linked to the Shuttle (with the OAST solar array in the payload bay) via a red, white, and blue path, signifying its maiden voyage. 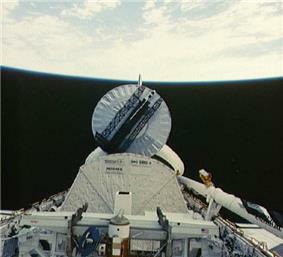 ^ "STS-41D". Spacefacts. Retrieved 26 February 2014. ^ "Risk of Space Flight" (PDF). Wyle Laboratories. Retrieved 21 June 2013. ^ "STS-41D". NASA. 2008. Retrieved 20 February 2008. 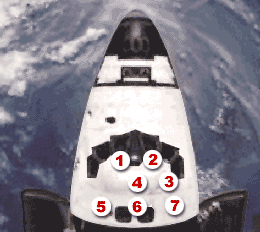 ^ "STS-41D pad abort". YouTube. 6 August 2009. Retrieved 30 April 2012. ^ a b "Roundup" (PDF). NASA. June 2007. Retrieved 21 June 2013. ^ "Photo of the week 19 (8 August)". CollectSpace. Retrieved 21 July 2013. ^ Walker, Charles D. (17 March 2005). Oral History Transcript. Interview with Ross-Nazzal, Jennifer. NASA Johnson Space Center Oral History Project. ^ Walker, Charles D. (14 April 2005). Oral History Transcript. Interview with Johnson, Sandra. NASA Johnson Space Center Oral History Project. ^ Vaughan, Diane (1996). The Challenger launch decision: risky technology, culture, and deviance at NASA. University Of Chicago Press. p. 51. STS-41-D National Space Transportation Systems Program Mission Report (PDF). NASA. (1985)The Dream is Alive. IMDb.